Members of Neturei Karta particpated in a news conference in Cairo to announce their participation in Viva Palestina, a humanitarian mission to aid the people of Gaza. Signs have been prepared to place on the sides of the trucks which will be used to transport medical aid from Cairo to Gaza in a convoy organized by Viva Palestina. Because the Viva Palestina group left for Cairo on Saturday, the Jewish Sabbath, the participants of Neturei Karta travelled separately, departing New York on Sunday for Cairo. British MP George Galloway is to fly out on Saturday 4th July, American independence day, from JFK airport in New York with the first of a group of hundreds of US citizens who are to form the largest ever aid convoy to head into Gaza. They will be heading off a month to the day from President Obama's signal speech in Cairo promising a new, more egalitarian US engagement with the Muslim world and a change in policy over Palestine and the Middle East from the disastrous eight years of the Bush administration. For six weeks the Viva Palestina campaign, launched by Galloway with an earlier convoy in March from Britain in March, has been building support for the mission across the US. George will be leaving from JFK with the convoy members on Saturday afternoon. They will be landing in Cairo on Sunday at midday.There will be over 200 people participating in the convoy which will assemble in Cairo before heading for the Rafah Crossing. It is hoped to enter Gaza on Sunday 12th or Monday 13th July. The convoy comes at a vital time for the people of Gaza as the International Red Cross report issued earlier this week confirms. There are one and a half million people now living in dire poverty, unable to rebuild after the destruction of the war in January of this year. This is the effect of the siege of Gaza imposed by the Israeli government for the last year. In the latest twist former U.S. Green presidential candidate Cynthia McKinney and other human rights activists were seized by the Israeli navy as they sailed in the Spirit of Humanity with aid for Gaza. The sign below will be placed on the trucks sponsored by Neturei Karta. Click to view a larger image. Rabbi Yisroel D. Weiss of Neturei Karta spoke at the Viva Palestina press conference in Cairo. Click the audio link (left) or view a video in English or Arabic below. Part 1 of ad hoc interview with Neturei Karta's Rabbi Felman on day 3 of Viva Palestina USA's convoy to Gaza. 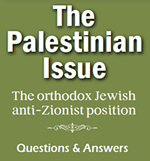 He touches on his community's views on Zionism, and what Zionists do to intimidated them. Also touches on the idea of widespread anti-semitism among Arab and Muslim people, which in his experience is a myth.